All the same features are included. Start and finish date columns to the right. Having a start date allows you to log tasks you can’t yet tackle; the finish date lets you show hard deadlines. A check box. You know what to do with this. 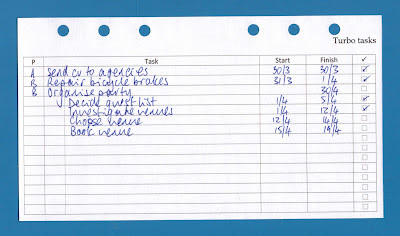 If your task is standalone or top-level just write over the faint line. If you are entering a subsidiary task, use it as your left-edge. It is a double-sided Personal page. As usual, you can download an editable Word file or a PDF version. Print onto A4, double-sided along the short edge. Use a craft knife to cut the sheets out using a steel ruler, using the crop marks to guide you. If you need detailed instructions, they're here. Then punch holes and file in your Personal-size Filofax. Ray, thanks for all your work on this and other forms. I've tinkered with some of your previous ones (still having a nightmare trying to print manual duplex on a 9-year old HP deskjet but thats another story). Im about to create a satellite Personal, to work in tandem with my 3-Kilogram A5 work filofax. Its now heavier than my laptop....but it never runs out of power. You're welcome. My A5 business Filofax is similarly hefty - much happier on a desk than being carried around.